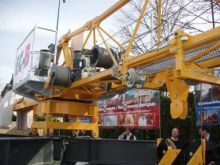 Liebherr has launched a 30tm flat-top tower crane at the Samoter show, the 30 EC-B 2.5. The crane can lift 1t at 30m jib-end, and its maximum lifting capacity is 2.5t. Two more jib lengths of 24.3 m and 18.6 m provide lifting capacities of 1,300 kg and 1,800 kg respectively. All loads are lifted in pure double-reeved mode. Like the rest of the Liebherr flat-top range, the crane has quick-release fasteners for jib and counter-jib, the patented LiConnect quick-release jib connector and the electrical plug and socket connectors for the drives and switchgear. A completely new feature is the pre-installed jib heel section with hoist and trolley gear and integral load hook. The dimensions of the shipping units are chosen so that they can be easily transported on a twin-axle truck with a 6m loading surface. A 30 EC-B 2.5 with 30 m working radius, 20 m hook height and complete ballast can be transported to site in only three trips. The 30 EC-B 2.5 can optionally be mounted on the newly designed cruciform base with a size of 3.0 m x 3.0 or 3.8 m x 3.8 m, or on foundation anchors. The undercarriage of the previous 30 LC model can also be used with the 30 ECB 2.5. All the drives for the Flat-Top crane come from the Liebherr Drive Technology Competence Centre in Biberach.